The EM-Tec silicon nitride films are the next generation silicon nitride films and include improvements on previous generations of silicon nitride support films. They combine debris free, stress optimised engineered films on a novel hexagonal robust silicon frame which has a reference mark for to enable sample/frame location and flat micro-structured TrueGrip edges. The properties of silicon nitride enables to produce a strong, chemical resistant, carbon free, low background ultra-flat TEM support film. They are ideal for application such as nano particle imaging, quantitative carbon analysis, chemical experimentation on the support films, real-time chemical reactions and crystal growth research, thin film research, on-film cell growth and multiple microscopy research techniques. The EM-Tec silicon nitride membranes are stress optimised for each window size and film thickness using proprietary algorithms and chemistry formulations. These support films are manufactured using state-of-the-art MEMS technology to produce debris-free, clean and highly planar membranes. The unique hexagonal shaped silicon frame has been developed to facilitate easy handling. The parallel sides together with the micro-structured TrueGrip edges enable easy pickup and handling of the frames compared to round frames or clipped silicon frames. The reference mark on one of the side helps with the orientation when the support films goes through multiple procedures. The unique hexagonal frames have a side length of 1.52mm and are fully compatible with the standard 3mm TEM grid. 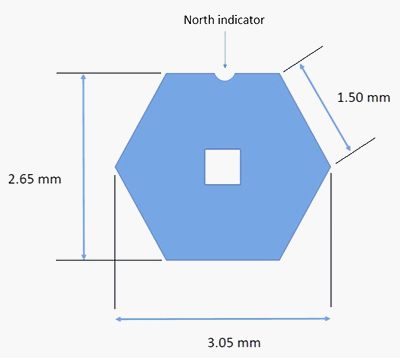 The 200µm frame thickness will fit most TEM sample holders. Packaged per 10 support films in the EM-Tec #28-000100 TEM grid box. has been developed to facilitate easy pickup and handling. Technical Support Bulletin: TSB 23-020025 Silicon Nitride Support Films & Silicon Apertures.